How appropriate that on a wave of films centred on strong female characters one of them should be about iconic US Supreme Court Justice Ruth Bader Ginsburg, also fondly known as Notorious RBG and the subject of a recent documentary (from Julie Cohen and Betsy West). A brilliant strategist who battled discrimination in her own life and career, RBG made it her mission to challenge gender discriminatory laws. She successfully argued the landmark case (representing, interestingly, a male client) that had a domino effect striking down obstacles to equal rights. She was a trailblazer with her Women's Rights Project at the American Civil Liberties Union. She's now an 85-year-old superhero – with her very own black-robed action figure – who fights the good fight, and always with style. On paper Felicity Jones doesn't leap out as obvious casting for the diminutive but daunting Jewish immigrant's daughter from Brooklyn, but she relishes the smart dialogue and brings emotional conviction and power to the inevitable climactic courtroom oration. Her Ruth has a sweet chemistry with Armie Hammer, who plays Ruth's lawyer husband Marty – a life partner so committed, proud and supportive (extraordinarily so for 50s America) he sets the bar for husbanding admirably high. He's also preposterously handsome. 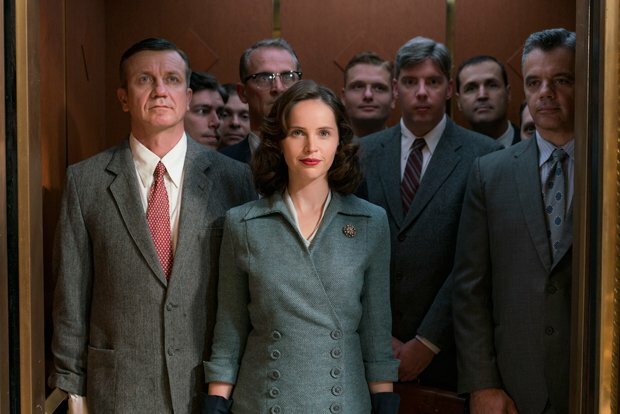 The intelligent screenplay – spanning Ruth's hostile reception as a young mother in the 50s entering testosterone-heavy Harvard Law School, to her let's-change-the-world legal manoeuvring in the 70s – was written by Ginsburg's nephew Daniel Stiepleman, who combines the legal drama and love story appealingly. Director Mimi Leder is herself a groundbreaker, being the first female graduate of the AFI Conservatory. With a background in cinematography, she provides visual interest, like images of Ruth purposefully mounting imposing steps, from law school to the Supreme Court. The result is a nicely inspirational, romantic hagiography and an unmistakable call to political engagement. General release from Fri 22 Feb.
Biopic of US Supreme Court Justice Ruth Bader Ginsburg (Jones), focusing on her journey from law student in the 50s to crusading lawyer in the 70s. Jones brings emotional conviction and power to the role, and her chemistry with Hammer as her lawyer husband Marty is sweet. Inspirational stuff.